This entry was posted in Substance Abuse and tagged Misuse, Signs and Symptoms, Stimulant on June 16, 2016 by Team Addiction Hope. Electronic dance music, or EDM, is exploding in popularity across the United States. Many young people spend their summers traveling from music festival to music festival to listen to their favorite EDM artists. While these festivals are meccas of dancing and music, they’re also a popular destination for taking the illegal drug Ecstasy, also known as Molly. At last year’s Electric Daisy Carnival (EDC) – a popular music festival held in Las Vegas – 24-year-old Nicholas Austin Tom ingested a fatal dose of Ecstasy, marking the fifth drug-related death since the concert’s debut in the city in 2011. The epidemic of drug overdoses at concerts like EDC is well known to authorities. Health and law enforcement officials have been warning us for a long time that these massive raves pose substantial drug risks, most notably including Ecstasy. Ecstasy is the street name for the stimulant drug MDMA, which users claim provides feelings of euphoria and boundless energy. Because MDMA is so common within the underground dance scene, some users mistakenly believe that the drug is safe to take. Taking Ecstasy can easily cause the body’s core temperature to rise to dangerous levels, often as high as 108 degrees. When the body becomes this overheated, the result is very often multi-organ system failure, which can lead to seizures, coma and even death. In fact, when the Electric Daisy Carnival was held at the Los Angeles Memorial Coliseum and Sports Arena, the number of drug overdoses reach such high levels that the local emergency rooms were completely overwhelmed, leading ER doctors to petition that no more raves be held in the facility. These complaints were taken seriously, forcing the concert’s promoters to move the venue to the Nevada desert. One of the most dangerous aspects of taking Ecstasy is that the user can’t be sure of what they’re getting. It is becoming more and more common for police officers to confiscate what they believe to be MDMA, only to later find that the pills contained other dangerous substances like crystal meth or bath salts. Even when the confiscated drug is MDMA, the potency can vary greatly, increasing the risk of accidental overdose. Also, because dance raves are already a sexually charged environment, the feelings of reduced inhibitions brought about by Ecstasy can lead users to engage in unsafe sexual practices. These drug-fueled sexual encounters run the risk of spreading sexually transmitted diseases such as HIV, hepatitis and more. Because there is no oversight when it comes to the manufacturing and distribution of Ecstasy, the content of each pill can range from pure MDMA to no MDMA at all. This is a recipe for disaster and has caused countless overdoses. The risk of overdosing on Ecstasy is greatly increased when taken in combination with other drugs or alcohol. While raves and concerts like Electric Daisy Carnival can be a fun way to spend time with friends and enjoy popular dance music, including Ecstasy in your summer plans can quickly cause things to take a tragic turn. 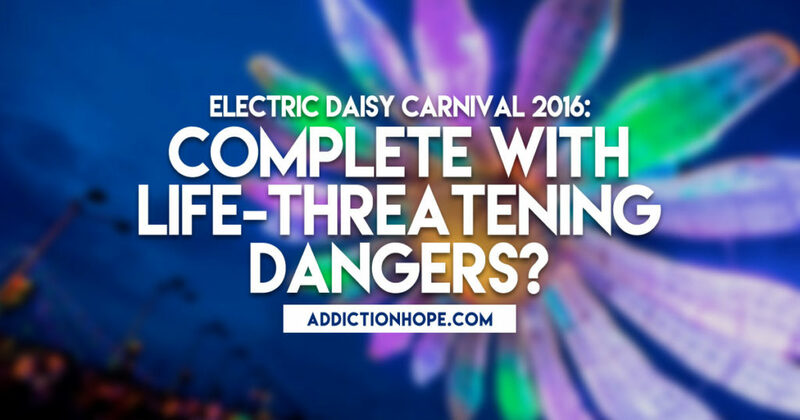 What are some fun, drug-free ways to get the most out of the Electric Daisy Carnival and similar festivals? Let us know in the comment section below!